The Blue Ridge Parkway’s highest elevation sign is found at the Richard Balsam Overlook, Milepost 431. When we stopped to snap a quick photo, it occurred to me that we didn’t have many miles left before our trip down the BRP would be complete. We were just a short hop from where the parkway ended and we’d have travelled the 469 miles of its length. Of course I was excited to see new things, but there is that element of traveling that tugs at your heart strings. Part of you never wants any of it to end. Oh, wow, that picture is awesome! It’s perfect with those clouds in the background. Too bad you and Mr. Galore weren’t in that one, too. Bittersweet picture. 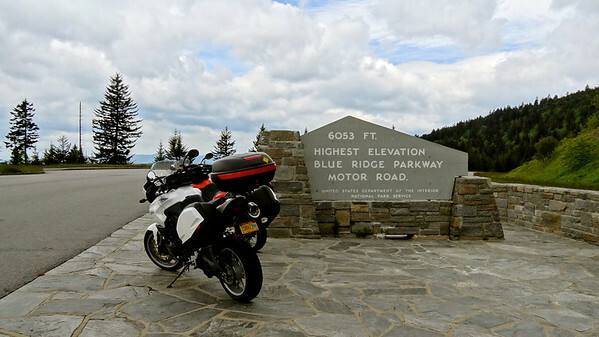 You made it to the peak, but the parkway is almost over. Sigh. I like the subtle blue of the sky peeking through.